Ready for fall flavors to hit your plate? 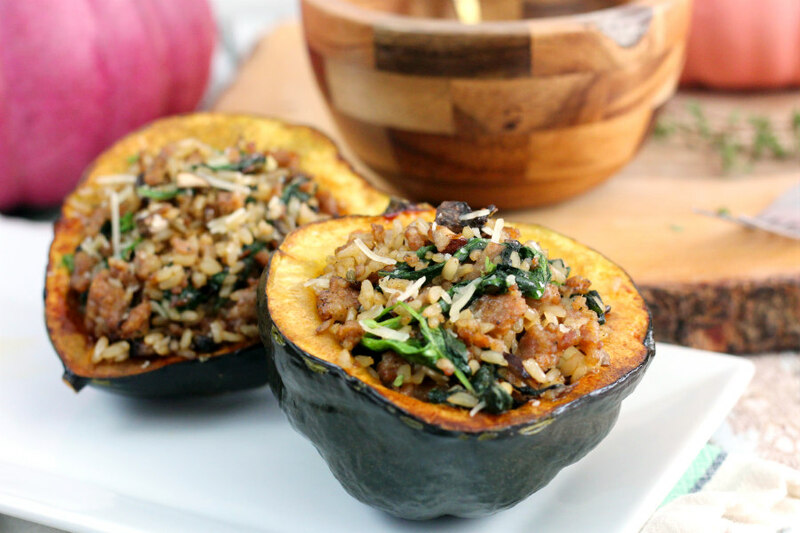 You’ll want to add this savory and delicious Sausage, Wild Rice, and Mushroom Stuffed Acorn Squash recipe to your menu! It’s that time of year again when our taste buds start craving things other than summer fruits, salads, and barbecued dishes. We branch out and delight in all of the different flavors of fall. Soups begin to get warmed up again and we’re not afraid to turn the oven back on. We visit orchards, pick the best apples, and bring home all sorts of squash. One of my favorites to bring home is acorn squash! I love having a small, local farm nearby. I make a trip there at least once a month to see what freshly grown fruits and veggies they have in stock. Recently, I took a drive to the farm with Hunter (I love pet-friendly businesses!) to pick up some apples. There were a couple bins of different kinds of squash sitting outside of the market. As I was picking a spaghetti squash to bring home, Hunter took interest in the acorn squash. I’m pretty sure he thought they were balls he could play with, but it was a good choice nonetheless! So I brought one of those home, too. A simple fall dish that’s an easy meal for two! My mom used to make acorn squash with a little butter and brown sugar on it. I remember it being a simple combo that tasted like fall in every bite. These days, I’m taking my squash from basic to bougy. Acorn squash has a naturally sweet, kind of nutty flavor to it. When it’s roasted, it has a buttery texture that’s undeniably delicious! It’s the perfect vessel to hold savory rice mixtures. If you want a simple fall dish with a lot of flavor, this is it! 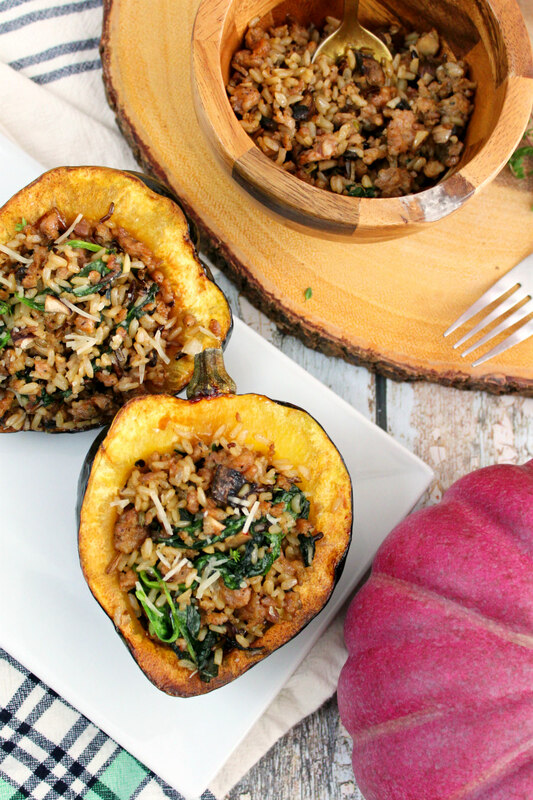 The buttery, roasted acorn squash gets stuffed with a savory mixture of wild rice, mushrooms, garlic, spinach, and crumbled sausage. 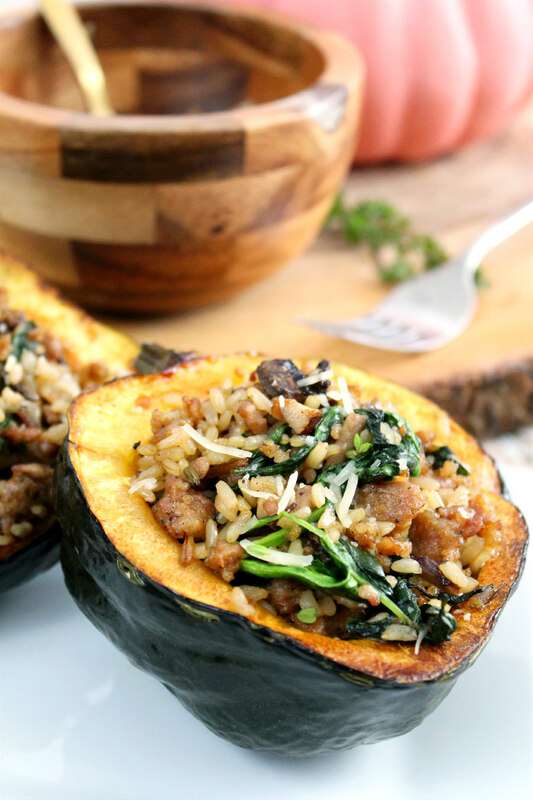 One half of a stuffed acorn squash equals one portion, so a full acorn squash is a really easy meal for two! Preheat oven to 400 degrees. Line a small baking sheet with foil. Brush the inside of the acorn squash with olive oil and place cut side down onto the prepared baking sheet. Bake for 30 minutes, or until the squash has softened and turned golden brown around the edges. While the squash is baking, begin preparing the filling. Heat a large skillet over medium. Add the ground sausage to the skillet and cook. Once the sausage is cooked completely, add in the garlic and cook until fragrant. Stir in the baby spinach, mushrooms, and cooked rice. Cook until the spinach has wilted and the mushrooms have softened, just a few minutes. Season with salt and pepper. Then, spoon the mixture into each acorn squash half. Reduce oven heat to 350 degrees and place the squash back into the oven. Cook for another 8 minutes. Remove squash from oven and serve with a sprinkle of red pepper flakes, Parmesan cheese, and fresh thyme leaves. Nothing against my mom’s simple, brown sugar, acorn squash, but this stuffed acorn squash definitely has it beat! If you want a perfect Meatless Monday meal for the fall, just ditch the sausage! It will still be great vegetarian dish that’s full of flavor! With squash season upon us, it’s time to switch up the dinner menu! Looking for a great squash side for fall? Check out my Parmesan Squash Fries recipe! 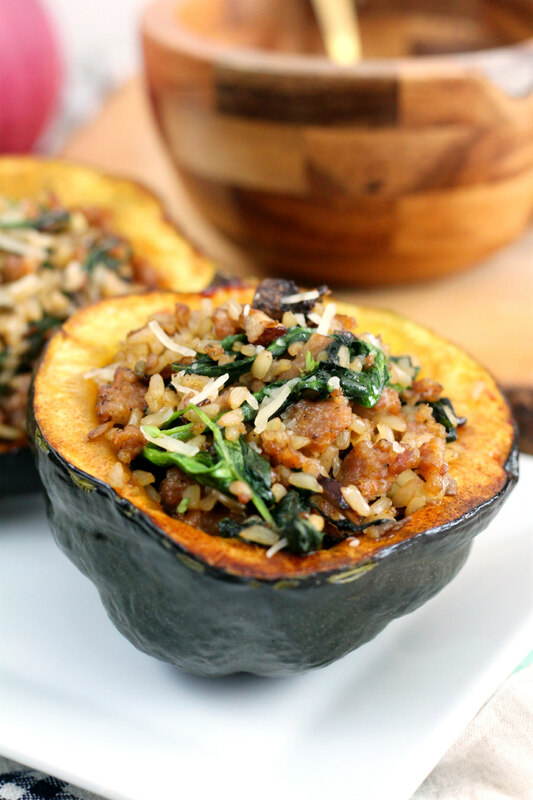 Are you a fan of acorn squash? If so, how do you like to eat it?